If you’re ready to get started, you can find more information, including another intro code sample, in the Google Forms reference section of the Apps Script docs. In the video, I challenge viewers to enhance the code snippet above to read in “forms data” from an outside source such as a Google Sheet, Google Doc, or even an external database (accessible via Apps Script’s JDBC Service) to generate multiple Forms with. What are other things you can do with Forms? One example is illustrated by this Google Docs add-on I created for users to auto-generate Google Forms from a formatted Google Doc. If you’re looking to do integration with a variety of Google services, check out this advanced Forms quickstart that uses Google Sheets, Docs, Calendar, and Gmail! Finally, Apps Script also powers add-ons for Google Forms. To learn how to write those, check out this Forms add-on quickstart. We hope the DevByte and all these examples inspire you to create awesome tools with Google Forms, and taking the manual creation burden off your shoulders! If you’re new to the Launchpad Online developer series, we share technical content aimed at novice Google developers, as well as discuss the latest tools and features to help you build your app. Please subscribe to our channel, give us your feedback below, and tell us what topics you would like to see in future episodes! 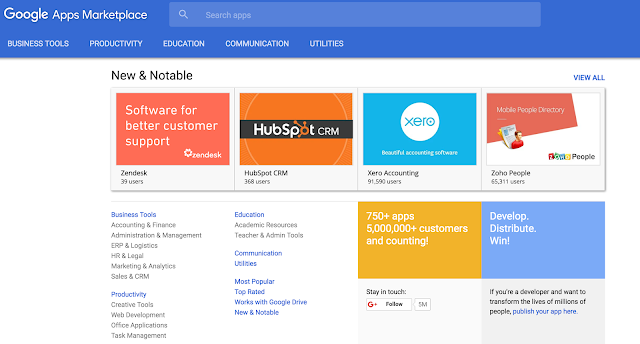 For six years, the Google Apps Marketplace has helped businesses do more by being the number one source to find third-party apps and integrations that extend what they can do with Google Apps. But with hundreds of popular apps to choose from, it’s sometimes hard for customers to discover the newest and most innovative ones that will help them attain their goals. Enter New & Notable, a new section in the Google Apps Marketplace that surfaces the latest and best third-party apps and integrations for Google Apps, and the developers behind them. Asana Dashboard: The new Asana Dashboard integrates with Google Sheets, allowing users to export task completion and performance information for wider tracking across teams. Read more here. Hubspot CRM: With the new HubSpot CRM app, users can now log emails sent from Gmail into HubSpot with one click, and automatically sync meetings between Google Calendar and HubSpot, no matter which system they came from. Read more here. Xero: With their latest integration, Xero — a provider of online accounting software for small businesses — lets users view Gmail messages alongside Xero transaction and activity details. Users can also save emails in Xero for reference, start a quote or invoice from within a Gmail message. Read more here. Zendesk: With their latest integration, Zendesk automates the Google Apps admin tasks of forwarding support e-mails into Zendesk and listing Google users within Zendesk. Read more here. Zoho People: Zoho People is a new HR management app for small businesses that lets users manage their HR portal directly from their Google Apps account, as well as add users directly to Zoho People, saving them from having to manually re-enter employee information. Read more here. Find these apps and many more (like AppSheet, GQueues, ZipBooks, Any.Do, Infogram, and LogoMix) in New & Notable. And if you’re a developer, learn more about how you can get your apps featured on Google Apps Marketplace here.